Do Not Miss Your Opportunity to try Upper Deck’s 2012 SP Signature Edition Baseball for FREE! When I tell people I work for Upper Deck the first thing they ask me about is baseball cards and usually the 1989 Upper Deck Ken Griffey Jr. rookie card. Upper Deck and baseball go together like mustard on hot dogs. So it has been disappointing for so many here at our corporate headquarters that licensing changes have greatly hindered Upper Deck’s ability to put out new baseball products. We have had some successes however like 2011 SP Legendary Cuts Baseball which was a product that consisted almost entirely of imageless cards, but we were able to come up with compelling designs to make it work. We have a very passionate group of creators just busting at the seams to produce new baseball releases and when we first shared the idea of 2012 SP Signature Edition Baseball with a small group of distributors and shops, we received a favorable response. With autographs from 50 Hall-of-Fame players (including some who are now deceased) and a bevy of current stars and prospects, we believed we could build a checklist with a lot of fire-power for collectors. And with ZERO redemptions in the product, we knew we were coming up with something collectors would appreciate. Unfortunately we were not able to promote the product before release, but take a listen to Upper Deck’s product manager Grant Sandground as he shares what it took to bring this set to market and why 2012 SP Signature Edition Baseball provides an exciting pack opening experience. And there have been some pretty significant cards pulled from the product giving collectors a reason to smile. 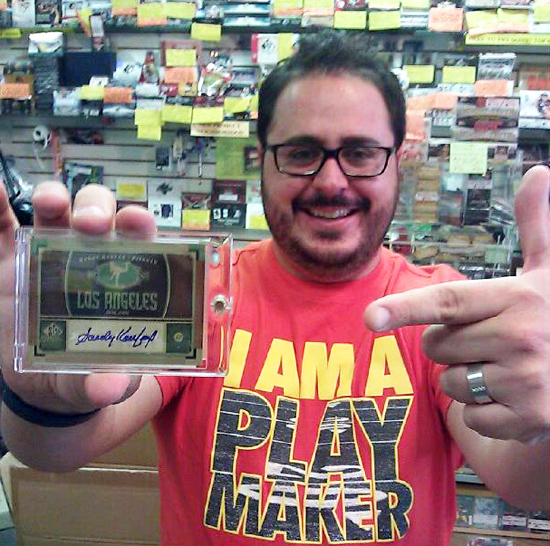 A collector smiles after pulling a Koufax autograph card! We frequently hear at shows that fans miss seeing new Upper Deck baseball products and we have seen many going back to older releases just to get the value and content they miss. Additionally, we have also seen independently created groups like this one on Facebook who are rallying to see Upper Deck back in baseball. We appreciate that a strong fan base for Upper Deck’s baseball products still exist and to thank fans for their support and to give them a chance to experience the first stand-alone baseball release in over a year. We want to give you a chance to open a pack of 2012 SP Signature Edition Baseball and try it out for yourself for FREE! All you need to do to participate is to review the short print checklist from the set and share in the comment section below which baseball player is your favorite in the set and why you would love to pull an autograph card of them in three sentences or less. We will give out twelve (12) packs to fans who most skillfully submit a compelling comment by 2:00 p.m. on Friday, July 13. We are using most of our sample packs with collectors here for this product as we truly want the fans to experience 2012 SP Signature Edition Baseball for themselves! For those who score a free pack, let us know how you do on the Upper Deck Facebook page or on Twitter! I would LOVE to pull a Bryce Harper auto. This kid has so much potential and I can’t wait to see the numbers he produces after he has the chance to mature as a hitter in the Majors. BOMBS AWAY!!! Whitey Ford, “the Chairman of the Board”, hands down was one of the greatest pitchers of all time. Ever since I was a small child watching him with the Yankees, I was amazed at his intelligence and confidence on the field. He had one of the best pickoff moves, and consistently low eras (lifetime 2.74) and a 0.690 lifetime winning percentage (236-106). They don’t make pitchers like him anymore. I would love to pull a Nolan Ryan auto because of all the good memories of watching him with my dad who is now in Heaven. Nolan Ryan was and still is my favorite player from when I was a kid. My dad and I would watch the Astros and Rangers games when he pitched and we will never forget Nolan punching Ventura in the face when he charged the plate; Priceless. Wow pulling out a Trevor Bauer, Bryce Harper and/or Brett Lawrie card would be a priceless feeling. Getting to see the next generation of great baseball players, and knowing that you could own a little piece of their legacy. I would LOVE to pull the Frank Thomas card. I collected his cards for over five years and put together 1300+ different Franks. This would be a jewel in my collection if I got my hands on this card!! I have been a Royals fan my entire life, and the team not having been to the playoffs since then is disappointing. But pulling an auto from a player on your fav team erases all of that and instills hope for the rest of the season. Autos from Bo Jackson or Bret Saberhagen would do that for me. My favorite player in the set is Derek Jeter. I don’t own any of his autograph cards and I would love for my first one to be from this set. He is a living legend and one of the best baseball players in history! My absolute favourite baseball player is Nolan Ryan. I remember fondly having in my possession a signed baseball from him many years ago, but alas, it got stolen. The next closest thing to getting that baseball back would be to pull a signed Nolan Ryan card from this new UD release! If I had to choose any player on that list, I would go with my boyhood favorite, Geoff Jenkins. Growing up a Brewers fan in the 90’s and early 2000’s, there wasn’t much to cheer for in Milwaukee. However, year in and year out, Jenkins was one of the Brewers lone producing bats on a team filled with mediocre players or guys not good enough to play in the MLB. It was great to see him go out a winner with the Phillies late in his career. My favorite pull would be Mike Schmidt. Being from southern New Jersey I grew up during the late 70’s and 80’s and to this am a huge Phillies fan. Mike Schmidt cards back in those days inspired me to become a huge fan of card collecting. If I didn’t pull a Schmidt, my next choice would be of course a Steve Carlton. Both of these players as well as Pete Rose, Tug McGraw, etc. were all my major influences back in the day and I would love to have something to remind me of those days. Thanks for any consideration. Ever since watching Strasburg’s major league debut with my dad on tv, I have longed for one of his autographed. I would love to pull an autograph of Steven Starasburg. My favorite player is Sandy Koufax. I have always been impressed how he handled himself with the media and on the field. He was so dominant in such a short period of time and walked away on top. I would LOVE to pull the DET-13 Alex Avila/Nick Castellanos/Jacob Turner auto card! I’m an insanely huge Tigers fan & these are 3 of my favorite Tigers! Living in Round Rock, I got to watch Hunter Pence come up through the system. He was the one who got me back into baseball. The one game that I remember, I went with a buddy and told him that Hunter Pence is going to be a star one day. Moments after I had told him that, Pence cracked a home run. Later in that same game he had a grand slam as well. Since then he’s always been my favorite baseball player. He is the one I’d love to pull out of this product as it would be an instant PC piece. I would love to pull the Dennis Eckersley. I remember when I was younger I was at an A’s game and he signed my glove. Well being that was my only glove second base consumed his autograph over the years as I used it in little league. I would love to have the card with his autograph on it will bring back alot of memories. Thanks Upper Deck for making some. Amazing cards. Without a doubt Ken Griffey Jr. is and was my favorite player ever. His nickname “The Kid” exemplified what was so magical about baseball as a child. Making amazing catches, a picture perfect swing, and always a giant smile. No one has ever been a better role model for kids and adult alike. I would absolutely love to pull a Derek Jeter! He’s the captain, a yank from day one, and just all around awesome regardless. I was born and raised in NY(state) and now live in TN where there are no Yankee fans, I need a Jeter auto for my collection and to help New Yorkify my home. I feel that the checklist permits a fair amount of Hall of Famers along with the mix of prospects and stars. I would love to pull the Jeter auto. He is a class act in the game and I love the way he plays the game. He is from my home state and is the bright spot in that city. It might be one of the greatest feelings to pull an auto of such a classy player. I have been collecting UD cards since you guys came out, the feeling of collecting is one that cannot be inter changed with any other. Having fund memories of the old time baseball So any players autographed card from the 50ies early years would put a smile on my face. Thanks again UD for the joy of collecting. I would pick Jeff Bagwell, one of the greatest Astros of all time, great hitter, and was always clean. One of my favorite players as a kid. Future Hall of Famer. Was never mentioned when it came to steroids. I would love to pull a Bo Jackson autograph. Bo Jackson was a great player who had a all star career in two sports that got ended too early. Bo knows baseball and rich knows he would love a Bo auto. i would love to pull gerrit cole. he is playing in altoona and saw him pitch he is the real deal. i grew up a pirates fan and it has been so long since they have been good. i suffered though losing seasons since 1992. for once the pirates have bonified stars. i feel like i deserve a pack for all the suffering. For me, breaking packs and pulling cards is a personal thing rooted in nostalgia and a connection. I have been a lifelong Cincinnati Reds fan, and I love Brandon Phillips. I would love to pull his card because frankly, I’ve not pulled many Reds autographed cards and this would be another way for me to realize that nostalgia and connection. These are three I would like to pull and I have never had a chance to get something like this. Upper Deck is the best at securing Autographed memorabilia. What a new great product, plus it is my birthday tomorrow so this would be awesome if I won. No question – Josh Hamilton. I respect everything that he’s done in his life – let alone in baseball – and feel like he’s one of the few, true rolemodels left in the sport. I have a jersey card and a couple beautiful inserts, the autograph would round out this mini player collection perfectly. My favorite player is Dennis Eckersley. I would love to pull his auto because he was an amazing closer and now a hall of famer. Gotta love the old A’s world champions mustache crew! I would love to pull Bo Jackson as he has captivated me ever since he took the sports world by storm. There will never be another athlete that made such a splash in two sports at the same time. Would love to pull this for my Mike Schmidt collection because he is the greatest Phillies ever! I would like to pull a Dennis Eckersley autograph. I am an A’s fan and as a kid watching Eckersley I had an opportunity to get his autograph while at a game at Angels Stadium but I didn’t have a pen or sharpie and was too shy ask to borrow one. Pulling an Eckersley autograph would be sweet. I was born wearing Dodger Blue in 75 and even today you cannot have a baseball discussion and not include Koufax. To be able to go back in time and grab Bo Jackson when he was with the White Sox Would have been awesome as well as Nolan Ryan as a Ranger…Now today getting a Bryce Harper and Stephen Strasburg dual would be insane and would be unreal. THis product is just too expensive for me to try and to have a free pack would be an awesome way to get people like me that cannot afford them into this product!! I would love to pull a Griffey Jr auto. Looking back as a young boy Griffey Jr reminds me of my childhood, playing ball, watching ball being with friends. Best way to describe it is like the movie The Sandlot. They way those boys loved baseball the passion that is how I feel when I think of Griffey Jr.
Kent Hrbek……… Growing up in Minnesota and watching the tapes of the twins winning the World Series gives me chills. Knowing that he was a big part in their wins makes me look up to him as a player and it would be great if I could get his autograph out of a pack of SP Signature Edition Baseball! If I could have an autograph of anyone on your list it would be Bob Feller. Patchily because he was the best pitcher ever for the Indians and arguable the best pitcher ever. But I would want his auto because of his service in the Military I look to him as an example he left his great baseball carer so he could go oversea and defend our Country. HOLY CRAP! That’s a sick card!! If only it had Bubba Starling. Then it would be the MOAC.. Mother of all cards. WOW that is a great checklist. For me it is an easy pick Nolan Ryan it was the First auto I ever pulled out of the box 1990 upper deck still my favorite card of all time only Ryan auto I ever pulled would love to pull his auto again. I have been following the Braves since he was first called up. I have been an avid collector of sports cards about the same time. He is one player that I have never pulled and hopefully I can pull one of his cards before he retires. I would love an Ernie Banks SP Signature Edition Cut. Faced so much being one of the first African American players in MLB and always stayed so positive. He could also smack the leather right off the ball! As a life long Yankees fan, I have to go with Derek Jeter, although that Rizzuto/Ford card that was pulled by Beckett was awesome! Jeter IS the modern day Yankees with an unquestionable and unchallengeable career that should surely land him quickly in Cooperstown. I was fortunate enough to attend the 2001 World Series game where Jeter hit that walk-off Home Run in the early morning to become “Mr. November” so that card, NYY-12, would remind me of that amazing moment every time I look at it, which is one of the best things about collecting cards, their ability to take you back to those magnificent moments of your life. For me, pulling an auto of Roy Halladay would bring back some great memories, watching him pitch in Toronto. He was my favourite Blue Jay and when he left it was never the same! Having his auto pop out of a pack of SP Signature Edition Baseball would be a sweet pull for me, gotta support the only Canadian team in the MLB!! Cal Ripken Jr.My favourite player growing up and still is.Lastly….come one man……….it’s CAL RIPKEN!!!!!! To have a chance to pull at Sandy Koufax auto in odds of 1 in 14 packs is truely amazing. These odds are unbelievable and I have seen some really as we call in the hobby “SICK PULLS”…….Yesterday at the shop somebody pull an autograph # /5 and it had SEVEN autos on the card two being Bauer and Hosmer. Thank you and grrrreat stuff UD! I’m thinking Bo Jackson would be my favorite at the moment. What more can you ask for…2 sport superstar! Pulling a Sandy Koufax autograph would be marvelous. He was one of my favorite players as a kid; one of my most heartbreaking childhood memories was when I lost a baseball with his (facsimile) signature on it down a storm sewer while playing catch with my father… Having the opportunity to land an authentic signature is amazing.